Sometimes you don’t need a grand opera perfume to satisfy your cravings. A simple composition will do. Such is my latest discovery, Jo Malone Mimosa & Cardamom. It makes me think fondly of the early days of the house when Jo Malone offered simple, unaffected but clever compositions like Lime Blossom & Basil and before the marketing teams and accountants took over. Mimosa & Cardamom has a bright, cheerful personality, and it, refreshingly, smells like the brand didn’t skimp on the formula price. It’s a floral cologne with a spicy twist and lots of quirky charm. The promise of mimosa and cardamom is duly fulfilled. The mimosa smells of blanched almonds and cucumber peels, with a characteristic hint of violet, while the cardamom is lemony, metallic and cooling. Both notes are clear and bright. Mimosa is a powdery ingredient, but thanks to a generous dose of spice, cardamom augmented with pepper and citrus, it feels radiant and airy. Its unconventional character also makes flowers acceptable even to the most classically minded men. Cardamom is an extremely volatile material, and after 30 minutes or so, it leaves the scene, having set the uplifting mood. The next stage is a soft, creamy floral with richer almond accents and a dose of musk. I was trying to decide why Mimosa & Cardamom evokes the languor of summer days, and I finally realized that it has to do with its mildly tropical allusions–sun cream, yellow mimosa blossoms and warm skin. Also, once it loses cardamom and settles into its long and velvety drydown Mimosa & Cardamom reminds me of the ultimate tropical perfume, Serge Lutens Datura Noir, with the main difference being that Datura Noir is sweeter, stickier and more saturated. Mimosa & Cardamom is my new favorite. It has two of my favorite ingredients, mimosa and cardamom, presented in a clever manner. It lasts well, especially for a cologne. It’s the next closest thing to burying my face in a bouquet of mimosas. In my small mimosa hall of fame it sits next to L’Artisan Mimosa Pour Moi, Yves Saint Laurent Cinéma, and the long discontinued Yves Rocher Mimosa. If a mimosa grand opera is what I’m after, I turn to Frédéric Malle Une Fleur de Cassie and Caron Farnesiana, but on most mornings, a simple melody will do. If you have other mimosa favorites, please share. 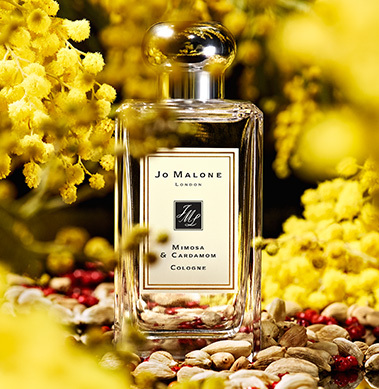 Jo Malone Mimosa & Cardamom includes notes of cardamom, mimosa, and tonka bean. Victoria: I tried the new version, but it felt too flat and one-dimensional. It seemed like it was missing something. Victoria: I went through a bottle of Champs Elysées at one point, and yes, it’s such a pretty mimosa. I should revisit it. kayliz: Oho, another topic — intriguing! Thank you for the lovely review — I wouldn’t have given this a second glance from the name, but it’s now definitely on my to-try list. Victoria: It’s like Jo Malone’s early perfumes–simple, but still different enough from the rest. Sandra: Ah! I remember Poeme Cornelia! Is that still in production? Areej: I tried mimosa and cardamom last week and I enjoyed spicy aspect of it . I agree that Jo Malone Scents don’t last very long and the price is steep, but one of my favorites is blue agava and cacao. It has excellent longevity on my skin and I find the notes exhilarating. None of the others appealed to me. Mimosa and cardamom was the second that has caught my attention, perhaps not full bottle worthy, but still quite nice. Victoria: Thank you for reminding of Le Mimosa. I haven’t smelled it in a while. C. Brown: I just tried Jo Malone today, albeit 3 scents that I layered (Wood Sage & Sea Salt + Velvet Rose & Oud + Red Roses), and 8 hours later and the scent lingers on. limegreen: You hit the nail on the head, Victoria, Mimosa and Cardamom feels more like the “classic” Jo Malones, rather than some of the forgettable flash in the pan types they’ve been releasing. I’d love to try Cinema. How does the Yves Rocher Mimosa compare to Mimosa Pour Moi? Victoria: They’re a mixed bag, but since they release so much, I’m not surprised. On the other hand, it all makes me less likely to seek out new launches. I mostly tried Mimosa and Cardamom because my friend had a bottle and I figured that I might as well spray some on. Well, it was so much better than expected. Yves Rocher Mimosa was sweeter, more violet like and it had more presence than Mimosa Pour Moi. The best, though, was the shower gel. I couldn’t get enough of it. I also very much enjoyed sampling this one, and was surprised by its longevity on my skin. Scented Salon: Jo Malone is a lovely brand with truly quality perfumes and a beautiful aesthetic. My favorite is Pomegranate Noir, which I buy year after year. That does not happen with any of my other perfumes. Plus, their candles are amazing: they really do scent the whole house and are super classy to display. Victoria: I had an orange blossom scented candle, and you’re right, it had a great throw. I do think that the brand is overpriced, but some of their perfumes have a very distinctive aesthetic and I like colognes with a twist. Scented Salon: I would not recommend Cardamom Rose. Iva: Oooooh!! Thank you for this review, I’ve been hoping you’d cover this new Jo Malone scent. As a mimosa lover, I’ve had my eye on this newest Jo Malone, but was wondering if it would be worth the hefty price tag, haha, and now I’ve got my answer. As soon as you compared it to Yves Rocher’s Mimosa, I knew I’d love it. As far as mimosa favorites are concerned – I’ve never found anything better than the “simple and basic” Yves Rocher – to me, that was the perfect blend of mimosa with amazing sillage. Bond. No 9 – Fashion Avenue has great mimosa notes, but it does fade away quite quickly, especially at that price range. Annick Goutal’s Le Mimosa is kind of weak, dare I say it, as I highly respect that brand in general, especially how the citrus nuances are layered in Eau d’Hadrien, but the mimosa is just niether as strong or nuanced. Oh my, I could go on forever about mimosa scents, and am waiting to see if anyone mentions a mimosa-based perfume that I haven’t tried! And just to say, my personal favorite thing to do is layer tuberose-based scents with mimosa. I’ve found that tuberose and mimosa work perfectly on my skin. My optimal combination was: Profumum Roma Tuberosa (or Parfumerie Generale No.17) as a base, then layer Yves Rocher’s Mimosa over it. That is my personal heaven, scent-wise. Alas, since they discontinued the YR mimosa, I stopped my layering. Victoria: Thank you so much for so many ideas and such an interesting layering combination. Mimosa and tuberose sounds like a perfect match. I will have to try your blend with Mimosa Pour Moi (since my YR Mimosa is almost finished). Rosie Jeffery: I’m thinking about layering Marni with mimosa and cardomom to amp up the spice, could be an olfactory mess of course, but its such fun to experiment! Victoria: Perfume layering is fun. If it doesn’t work out, you can always wash it off! spe: Vanilla and anise is the one I have – the smallest bottle. Jo Malone scents do not impress me. I find them simple and uninspiring. Emma: I don’t like colognes anc I never really found Jo Malone very interesting. I might as well wear a nice deodorant by Vichy. Have you finally tried Serge Lutens Cracheuse de flammes and Renard Constrictor? You can read my Cracheuse review on Fragrantica, under highmaintenancegirl. Anka: What a lovely review, Victoria! Mimosa, the flower, always makes me smile, the canary bird yellow is so uplifting, perfect for this time of the year when one starts missing the brightness of the sun. Jillie: At last, a new Jo Malone that sounds like something I would like after so many dry years! Mimosa pour Moi was the first L’Artisan Parfumer fragrance I bought (and probably my first niche) and I loved it. I still use their Mimosa Marin home spray, now sadly discontinued; it brings spring and sunshine into the house. Victoria: I liked their Mimosa Marin candles, and I still have a couple of votives. They’re not the strongest from L’Artisan’s collection, but the scent is so true to the flower. Aurora: Such a lovely review, it seems Mimosa and Cardamom was a pleasant surprise, perhaps it will inspire me to give a chance to JM after all. Victoria: I forgot about Voyage, but you’re right, it has a lot of cardamom, and for that reason alone, cardamom fiends should try it. Jean-Claude Ellena seems to love this spice, and I notice it in many of his perfumes. irem: Thank you for the wonderful review. I was excited when I started seeing the ads of Mimosa & Cardamom in recent magazines. I am not very familiar with mimosa, but I love cardamom. So true that its scent is so fleeting. I store my cardamom pods in the freezer to slow down the loss of their wonderful fragrance. And when I make chai, it is always cardamom that finds a way to evade the cup before it is finished. Not surprising that the cardamom note does not last past half an hour. Victoria: It’s a good idea to store cardamom in the freezer. It’s one of the most volatile aromatics, and those jars of ground cardamom seeds are pretty much always scentless by the time you bring them home. I usually keep a jar of pods and a small mortar, and I grind or crush whatever I need. Maria B: Mimosa is my favorite floral note. Bulgari Pour Femme is my default fragrance in all seasons. I have both the EDP and the parfum version; I think the latter might have been available only for a short time. Farnesiana is my mellowing out fragrance. Malle Une Fleur de Cassis is the opposite. Divine L’Infante is cheerful. Victoria: Cardamom adds some zest and vivacity to mimosa, and it’s an interesting duo. I didn’t really have a mimosa favourite until I tried this one. (I do love Une Fleur de Cassie, but for me, it’s an absolutely different genre.) Like you, I find Mimosa & Cardamom exremely easy to wear and very charming, too. I especially like that creamy quality and it lasts the entire working day on me. Victoria: 🙂 Une Fleur de Cassie is definitely a different thing altogether; more in the grand opera category, and while I wear it casually, sometimes it’s too much. rickyrebarco: Victoria, I loved Mimosa and Cardamom as well at first sniff. I enjoy real mimosa but had yet to find a mimosa perfume that worked for me. This one does! It’s so fresh and simple, yet so delicious. I agree that Jo Malone is going back to its roots with this one. The cardamom reminds me of a cool dish of kheer with that wonderful silver thin leaf on top. yum! I have found that Mimosa and Cardamom layers well with other spicy fragrances. I layered it with Jeffrey Dame’s Dark Horse spice fragrance and it smelled really delicious. The 2 fragrances complimented one another very well. Enjoy! Victoria: Ah, kheer, yes, one of my all-time favorite desserts. I can see what you mean, because Mimosa & Cardamom smells creamy and milky towards the drydown. Very comforting. This review prompted me to layer my Gucci Eau De Parfum with Kenzo Summer over it. Smells really nice! Cardamom and Mimosa … who knew? I must be turning into a layering queen because I can confirm that layering L’Heure Bleue with Yardley Iris over it does indeed smell like Apres Londee . I got my sample of Apres, and was soooo surprised. The only difference to this nose is that the layering trick is more potent smelling and lasts until the cows come home! So, thank -you BDJ for teaching me how to do this! The numero uno standout of my new batch of samples is Knize Ten. I put it on, and watched Steve McQueen, and Faye Dunaway in ,”The Thomas Crown Affair.” I loooove to do this. Wear the perfume of an actor while watching their work. angeldiva: Thanks! Yes, a Dandy on a Vespa! What an AMAZING frag. Gee, I was expecting more. The wonderful clove of Youth Dew seems absent. My sample smells a tinsy bit rancid, but I think that’s the perfume. I’ve decided to purchase some Youth Dew, and layer Prada Amber over it. I just don’t know if I should buy the vintage on ebay: there are many bottles, and they are cheap. Or, just buy a new bottle. My Prada is the mens version. There are some wonderful areas of explanation I found around the internet. They explain the difference in packaging between old Youth Dew and New Youth Dew. It has to do with the size of the font on the box, and how high up the brand name appears to be placed. Lucky Woman! If I ever find a sober, Catholic man to marry: I’ll spray it all over him! Karen: Had tried this at the Jo Mallone counter (and also received a sample from Limegreen!) and was surprised that I didn’t care for it. I love Fleure de Cassie (and plan on wearing it for a big old fancy upcoming event, it is quite a grande dame perfume) and love cardamom, so thought how can it not work? My daughter was happy for the sample, though. And now I’ve got a list of mimosa perfumes to try thanks to your review and everyone’s comments. Victoria: Jo Malone does nice photography, and it’s one of the few brands that consistently do so.